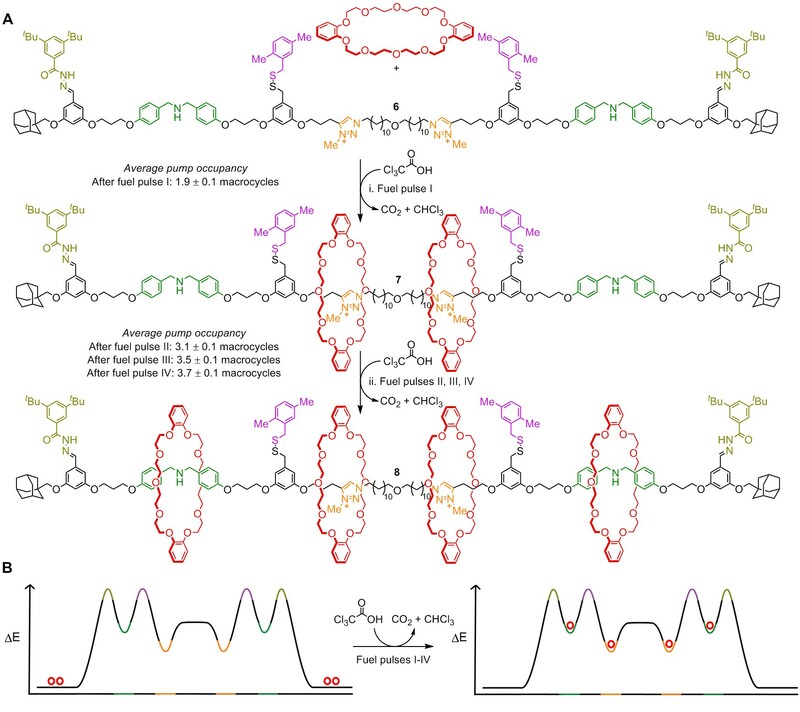 ‘Rotary and linear molecular motors driven by pulses of a chemical fuel’ Sundus Erbas-Cakmak, Stephen D. P. Fielden, Ulvi Karaca, David A. Leigh, Charlie T. McTernan, Daniel J. Tetlow and Miriam R. Wilson, Science, 358, 340-343 (2017). Full Article. The design of nanoscale motors in which the components move with net directionality has tantalized scientists since Feynman’s discussion1 of the physics of a theoretical tiny ratchet-and-pawl. 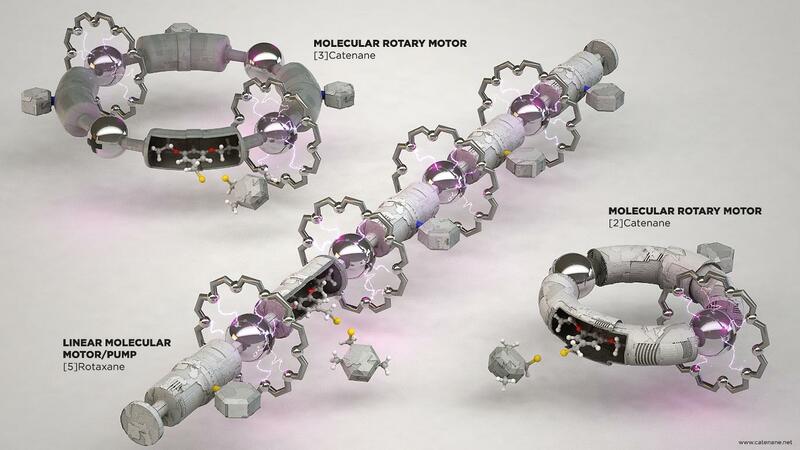 Light-driven rotary molecular motors based on overcrowded alkenes have famously2 been developed by Feringa,3 however that mechanism is only useful for rotary motion and cannot drive linear molecular motors nor be adapted to run off chemical fuels (like biological motors employ). Now scientists at the University of Manchester have developed a pulsed chemically-fuelled molecular motor mechanism that can be used to power both rotary and linear molecular motors.4 It uses an energy ratchet5 mechanism (phenomenologically related to Feynman’s ratchet-and-pawl) whereas motor proteins (and a synthetic motor-mechanism the Manchester group reported recently6) use information ratchet7 mechanisms (phenomenologically related to Maxwell’s Demon8). Figure 1. Unidirectional rotation of a catenane molecular motor through an energy ratchet mechanism. The energy ratchet relies on switching between acid and base, which simultaneously switches the heights of both energy maxima and energy minima for ring movement (Figure 1). The fuel employed is trichloroacetic acid (Cl3CCOOH), which undergoes base-catalyzed decarboxylation. By adding an excess of Cl3CCOOH to a solution containing the molecular motors and triethylamine (Et3N), the medium becomes first acidic and then (as the Cl3CCOOH decomposes) basic.9 This means a single pulse of the Cl3CCOOH fuel can unidirectionally rotate a catenane motor 360°, generating chloroform (CHCl3) and carbon dioxide (CO2) as the only waste products of motor operation (Figure 2). The process can be repeated with each pulse of fuel driving complete directional rotation of the components. Figure 2. Repetitive operation of a rotary molecular motor with pulses of a chemical fuel. The same motor-mechanism was used to power a catenane rotary motor (two small rings rotating directionally around a larger one; Figure 3) and a linear molecular pump (Figure 4). Figure 3. A catenane rotary motor driven by pulses of chemical fuel. Figure 4. 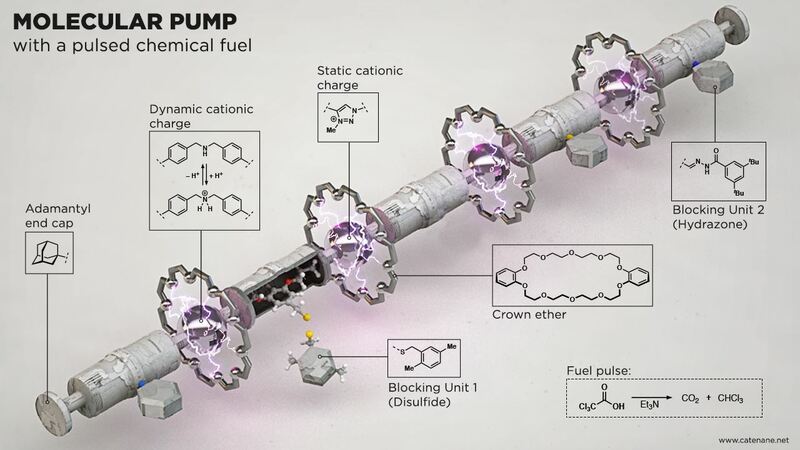 A linear molecular motor/pump driven by pulses of chemical fuel. R. P. Feynman. The Feynman Lectures on Physics, Vol. 1, Chapter 46. Massachusetts, USA: Addison-Wesley, 1963. N. Koumura, R. W. J. Zijlstra, R. A. van Delden, N. Harada and B. L. Feringa. Light-driven monodirectional molecular rotor. Nature 401, 152-155 (1999). S. Erbas-Cakmak, S. D. P. Fielden, U. Karaca, D. A. Leigh, C. T. McTernan, D. J. Tetlow and M. R. Wilson. Rotary and linear molecular motors driven by pulses of a chemical fuel. Science 358, 340-343 (2017). J. V. Hernández, E. R. Kay and D. A. Leigh. 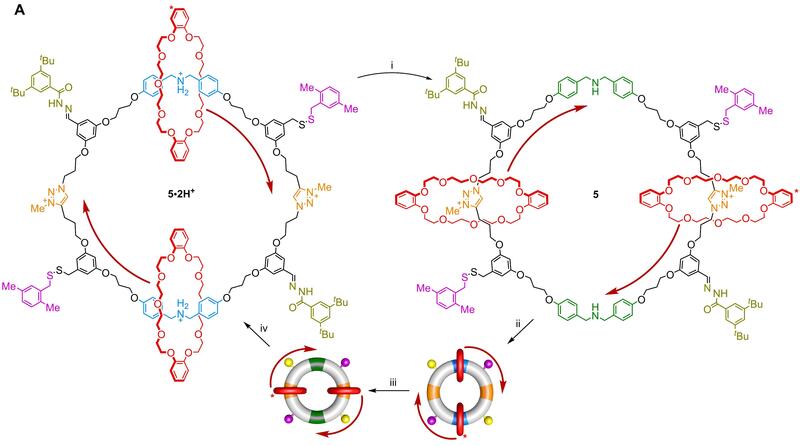 A reversible synthetic rotary molecular motor. Science 306, 1532-1537 (2004). M. R. Wilson, J. Solà, A. Carlone, S. M. Goldup, N. Lebrasseur and D. A. Leigh. 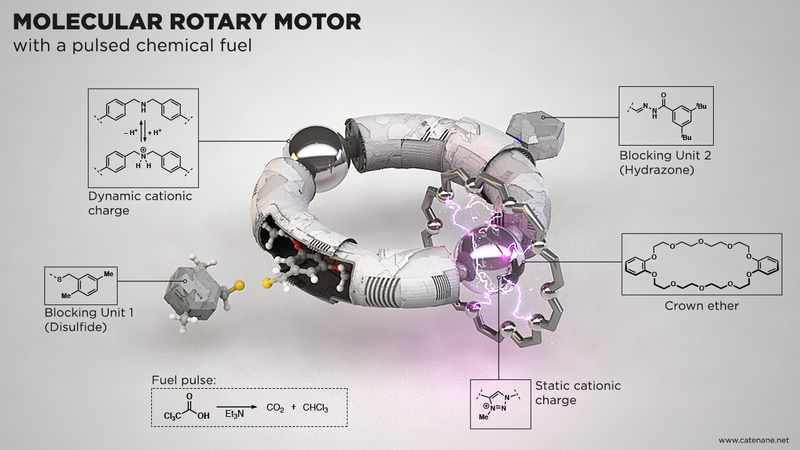 An autonomous chemically fuelled small-molecule motor. Nature 534, 235-240 (2016). V. Serreli, C.-F. Lee, E. R. Kay and D. A. Leigh. 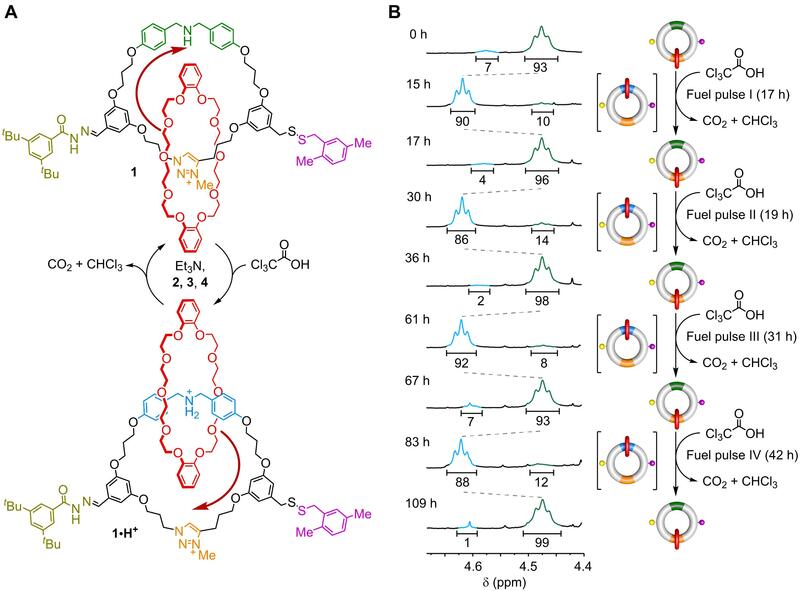 A molecular information ratchet. Nature 445, 523-527 (2007). Maxwell's Demon 2. Entropy, Classical and Quantum Information, Computing (Eds. : H. S. Leff, A. F. Rex), Institute of Physics Publishing, Bristol, 2003. For application of related fuels to a molecular switch, see: J. A. Berrocal, C. Biagini, L. Mandolini and S. Di Stefano. Coupling of the decarboxylation of 2-cyano-2-phenylpropanoic acid to large-amplitude motions: a convenient fuel for an acid-base-operated molecular switch. Angew. Chem. Int. Ed. 55, 6997–7001 (2016). E. R. Kay and D. A. Leigh. Rise of the molecular machines. Angew. Chem. Int. Ed. 54, 10080-10088 (2015).